This recipe for lamb shanks combines the lamb with wonderful spices and dried fruits. The spices are reminiscent of Moroccan cuisine, which also uses quite a bit of lamb. Roll the lamb shanks in flour seasoned with salt and pepper. Place the meat in a baking dish large enough so they are mot piled on top of each other. Cover tightly and bake at 350°F until the meat is tender, 1 1/2 - 2 hours. Drain off the fat. Combine the water, prunes, apricots, honey, cinnamon, allspice, cloves, lemon juice, lemon peel and salt. Bring to a boil and simmer for 5 minutes. Pour the fruit mixture over and around the lamb shanks. Cover and bake at 400°F for 30 minutes. This recipe incorporates all of the traditional flavors of Moroccan cuisine. Moroccan meat recipes often incorporate spices like cinnamon, which we tend to reserve for desserts. Allspice and cloves are two more spices often used in this cuisine. Moroccans also often add fruits to their meat dishes. Apricots are a favorite. One of my favorite meat stew recipes has dried apricots and cinnamon. Delicious! 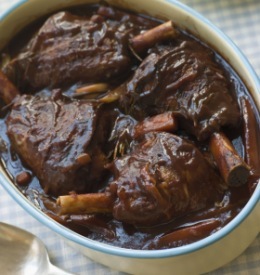 The combination of dried prunes and apricots spices with cinnamon, cloves and allspice cooked with the lamb shanks will create the most wonderful aroma in your kitchen as it bakes. The long slow cooking will also ensure fantastically tender lamb. It will pretty much fall off the bone. Served with some rice or couscous (which is traditionally Moroccan) and a side vegetable, this makes a wonderful dinner recipe for entertaining. If you are looking for recipes that are really quite easy but look and taste like gourmet recipes, try this lamb. I think you will love it. I would serve these lamb shanks with plain white or brown rice, or go fully Moroccan and serve it with cooked couscous. Find our couscous salad here.